I am now entering my 5th year as a pitmaster of a competitive BBQ team, and as I look back at the lessons learned I realize they were almost all learned the hard way. I attribute most of our success to trial and error…. with a little luck mixed in there as well. There are so many things I wish I knew our first year. In the spirit of BBQ brotherhood I’d like to share some of these lessons to help ease the learning curve of future pitmasters. 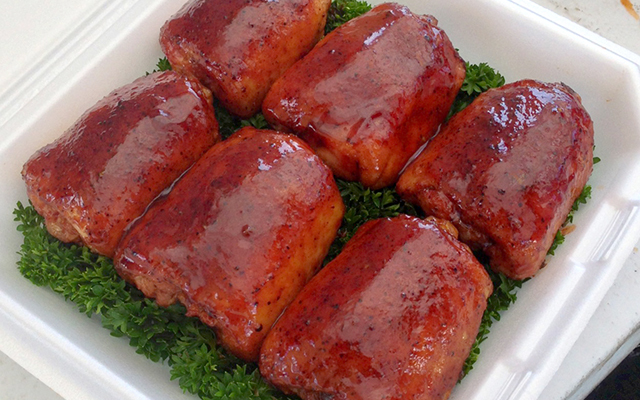 #1) Flavor– Flavor is the highest valued score for competition BBQ and can also be the most challenging. When you cook competition BBQ you have to throw everything you’re use to out the window. You are cooking for a wide range of judges and need to create a flavor profile that isn’t offense to anyone (not too spicy, not too sweet and not too salty). Being non offensive is more valuable then having something you think tastes the best. Another key to flavor is to remember you are cooking one bite BBQ, You will need to pack everything you are trying to get across to the judges into one bite. Your BBQ should have multiple layers of flavor and actually change flavors as the judge chews, starting sweet and finishing with a little heat. Tip: Don’t try and be a hero using your own rubs and spices, there are great products that people have spent years perfecting on the competition circuit, start there. #2) Tenderness-Tenderness is the second highest score for competition BBQ. Tenderness means many different things to each meat, I suggest taking a judging class to learn all the ins and outs. Chicken will have to have bite through skin and moist meat that isn’t rubbery. Bites into ribs will have to pull away cleanly from the bone without falling apart, leaving a perfect bite mark. Pork is probably the hardest with no clear guidelines, you want to be right on the edge of too tender. Brisket will have to pull apart easily without crumbling. The best way to perfect these is to practice and keep track of what temperatures work best. Tips: Ideal chicken thigh temperature will be in the 180-190 degree range. Ribs are best checked with a toothpick and should have no resistance when placed in-between the bones. Pork is best in the 195-200 degree range. Brisket is done not by temperature but by feel, a thermometer probe should go in with almost no resistance. #3) Appearance– This is the final category the judges will score on and has the least effect on the overall scores. That being said this category can be the difference between a 1st place call or a 10th place call. It is the one category you should be in complete control of every time. The judges are taught to score appearance by how bad they want to eat it. Entries need to be clean, by clean I mean they need to be symmetrical with nothing that will distract the judges eyes. They also need to be shiny, if a judge can see their reflection in the meat you know you’ve done your job. Judges eat with their eyes first and even though appearance has the least weight when tallying your scores, it WILL effect your taste and tenderness scores. Tips: Consider your appearance from the time you open the meat from its packaging to the moment you close the lid of your turn in box. This includes trimming perfectly, seasoning evening, placing on the smoker correctly, spritzing regularly and taking your time when finalizing your turn in box. Another tip is to add butter in your sauce and spritz before you close your turn in box to help create a shine. 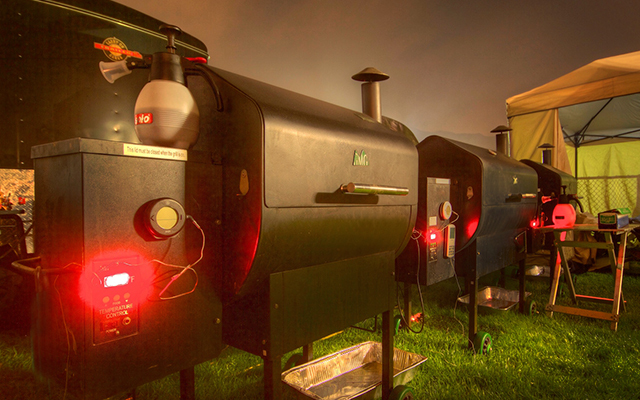 #4) Organization– This isn’t a category for the judges, but it’s the most important ingredient in competition BBQ. This is what separates the rookies from the pros and will be the most beneficial to learn. For a professional pit master the competition starts the week before the actual turn in times. The biggest mistake most new pitmasters make is to do everything on site, and we were guilty of this our first year. Overtime we learned to minimize what we take with us and what we have to do at a competition. The best thing you can do to break the learning curve is work from home. The days leading up to a BBQ competition need to be set aside for trimming meats, creating sauces, making injections and organizing your truck or trailer. The biggest advantage of this is TIME. Doing prep beforehand will give you the time to focus and perfect your sauces and trimming and give you more time at the competition. Tips. mise en place- this term meaning putting in place is very helpful when the crunch time of turn ins start, keeping you organized and ready for any curve balls you may have. Another tip is use a vacuum sealer. I vacuum seal all my trimmed meats and also all my sauces and injections, this helps preserve and also saves space. And my last tip is get to a contest as early as possible, this gives you time to get set up, make final preparations and most importantly relax helping calm your nerves before the big show down. I hope these tips help you on your journey down the competition trail. If you have learned any of your own lessons please feel free to share in the comments below, we’d love to hear them. For more information on competition BBQ take a look at our Life as a BBQ Competitor.